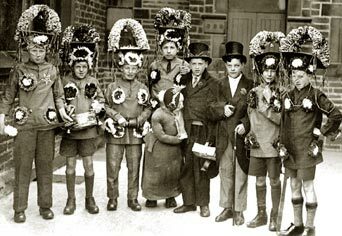 Pupils of Midgley School, pictured above, are credited with helping to revive the tradition of the Pace Egg Play. Milltown Memories is a glossy magazine devoted entirely to the Upper Calder Valley, West Yorkshire. Issue 3 is now out. Click items on the left for taste of features and photos included in the Winter 2002/03 "Bumper" issue of Milltown Memories . Or click on the photo above of the "scene from the sewing shop" to see a larger version. The 48-page Issue 3 is on sale (£2.50) now throughout the Upper Calder and at selected outlets in Halifax. You can order online this and previous issues, or by post from Milltown Memories at: 6 Melbourne Street, Hebden Bridge, HX7 6AS. Tel: 01422 845050.